Eating a well-balanced diet is an important part of a senior’s health and wellness, as nutrition needs change as they age. Research suggests that those of us who eat the right amount of protein may have a lower risk of stroke, and seniors who eat protein at all three meals daily could experience reduced muscle loss. 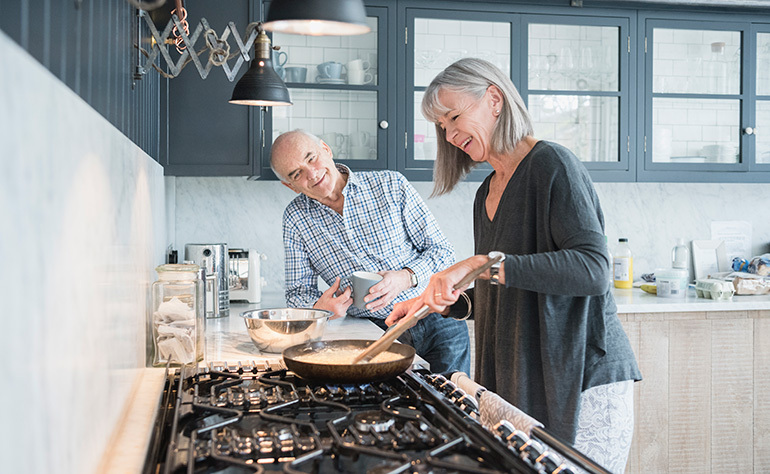 A diet that is high in protein can increase energy, reduce blood pressure, and maintain bone health – all of these benefits are crucial for aging bodies, so consider adding a little extra dose* of protein to your daily diet with these creative tips! If you are aiming to increase your daily protein intake, you may want to consider swapping out some of your usual snacks with some high protein alternatives. When you’re hungry between meals, you can find a quick satisfying snack in hard boiled eggs, steamed edamame or lean beef jerky. If you’re pressed for time, reach for a handful of unsalted nuts or seeds, such as almonds, walnuts and pumpkin seeds. High protein snacks are especially good for those busy on-the-go days, as protein-dense foods are proven to increase satiety, meaning you’ll stay full for longer. Start the morning right with an energizing protein-rich meal. A poached egg with whole grain toast is a great option, especially considering the surprising amount of protein that whole grains contain. If you usually enjoy a bowl of cereal as the sun comes up, add a sprinkling of nuts and seeds to your bowl to give it an extra protein boost. If your favourite breakfast includes yogurt, switch to Greek yogurt for an easy protein upgrade. Or, change things up and enjoy a serving of smoked salmon, which is protein-dense as well as rich in omega-3s – but don’t overdo it, as smoked fish can be high in sodium! Meat isn’t the only way to work protein into your daily meals – get a little creative with how you get your protein and incorporate more protein-rich vegetables and legumes to your diet! After all, diets that include plant-based protein are shown to increase cardiovascular health and prevent chronic diseases. Make a protein-rich side dish like Chickpea Salad with Lemon Yogurt Dressing, or make veggies the main event with Bean Burgers with Coriander Cream, or Smoky Lentil Patties with Cucumber Slaw. Striking a balance in nutrition is crucial to living a healthy life, especially as you age. Speak to your doctor to find out how much protein you should be eating every day, and use these tips to creatively meet your protein goals. If you are having trouble preparing well balanced meals on a daily basis, learn how our meal preparation services can help. Our Bayshore Caregivers not only assist with meal preparation to make enjoying protein-rich meals at home even easier but can also help with all the grocery shopping, cleaning and housekeeping. *Bayshore is pleased to provide information that educates you as you strive to care for yourself and your loved ones. This blog contains information about Senior’s health and wellness in reference to protein intake. This information is not advice and should not be treated as such. Everyone’s dietary needs are different and we suggest you to consult with your doctor before making any changes to your diet especially if you are taking medications or have food allergies.